A Method for Determination and Simulation of Permeability and Diffusion in a 3D Tissue Model in a Membrane Insert System for Multi-well Plates Hao-Hsiang Hsu1, John-Kevin Kracht1, Laura Elisabeth Harder1, Kerstin Rudnik1, Gerd Lindner2, Katharina Schimek2, Uwe Marx3, Ralf Pörtner1 1Institute of Bioprocess and Biosystems Engineering, Hamburg University of Technology, 2Institute of Biotechnology, Department Medical Biotechnology, Technische Universität Berlin, 3TissUse GmbH A method for determination of permeability in a membrane insert system for multi-well plates and in silico parameter optimization for the calculation of diffusion coefficients using simulation are presented. 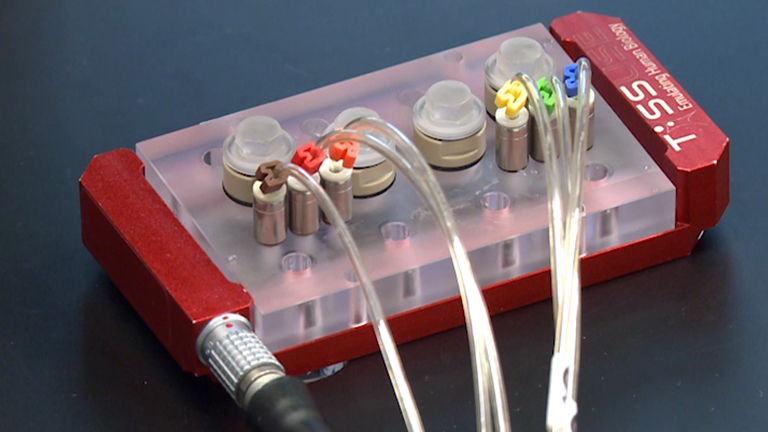 The Multi-organ Chip - A Microfluidic Platform for Long-term Multi-tissue Coculture Eva-Maria Materne*1, Ilka Maschmeyer*1,2, Alexandra K. Lorenz1, Reyk Horland1,2, Katharina M. S. Schimek1, Mathias Busek3, Frank Sonntag3, Roland Lauster1, Uwe Marx1,2 1Medical Biotechnology, Technische Universität Berlin, 2TissUse GmbH, 3Fraunhofer IWS Here, we present a protocol to coculture primary cells, tissue models and punch biopsies in a microfluidic multi-organ chip for up to 28 days. Human dermal microvascular endothelial cells, liver aggregates and skin biopsies were successfully combined in a common media circulation.